This book ships within India only. Description of "Dhatupatha of Panini"
The Dhatupatha of Panini gives 1943 dhatus. These are the building blocks of Sanskrit, known as the Roots of the Language. This book gives all the 1943 roots with Accents. Alternate listing of some dhatus makes the total count as 2056. However the Dhatu Serial Number is preserved so that looking up a dhatu in another book becomes easy.The Anudata, Udata and Svarita accent on a dhatu is usually not available in printed dhatupathas, so this book is a welcome addition for the Sanskrit enthusiast. In some cases the relevant Ashtadhyayi sutra is mentioned when a dhatu is difficult to conjugate. Well written Appendices containing the Maheshwar Sutras, the Devanagari Alphabet, and about Panini; make this book a sought for edition by the Academician or the Scholar. Immensely useful for graduate and post graduate students of Vyakarana or Vedanta. Ashwini is with the Sri Sri Ravi Shankar Ashram based in Punjab. He loves to practice Yoga, perform Homa, study Sanskrit and be at home. 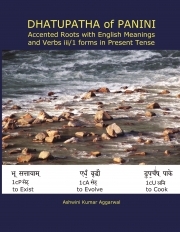 Reviews of "Dhatupatha of Panini"